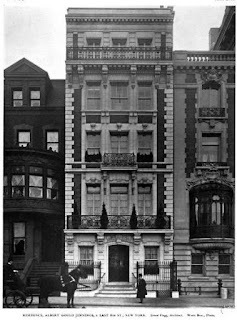 The Albert Gould Jennings residence designed by Ernest Flagg c. 1900 at 2 East 82nd Street in New York City. Jennings, son of Abraham Gould Jennings, founder of Jennings Lace Works, was partner with his father in A.G. Jennings & Sons. Click HERE to see the Jennings residence on google street view. Photo from Architecture, 1903. One thinks of the unified rows of town houses built 100 years earlier, and then looks at the boisterous streets full of 'ma tu vue' houses built 100 years later---usually handsome in themselves, but with little regard for each other, and it becomes a metaphor for the times, and for the way New York grew and has grown---a veritable cacaphony. Sort of like that sentence. I love the Hodge podge of styles in New York. But I always thought of this mansion as just an extension to the Duke Mansion. Poor thing.